NEW....This is where you put any personalization info needed to complete the order. 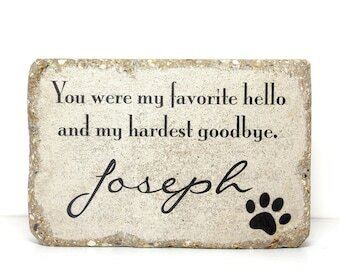 It will vary based on the layout, but could include name, dates, colors, message, etc. We are currently right on track and all orders are being made in 1-3 business days. 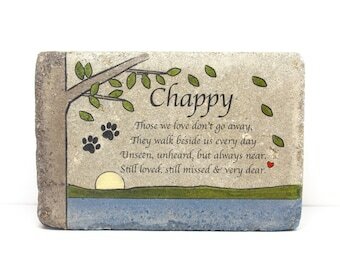 A CUSTOM Pet Memorial Stone. 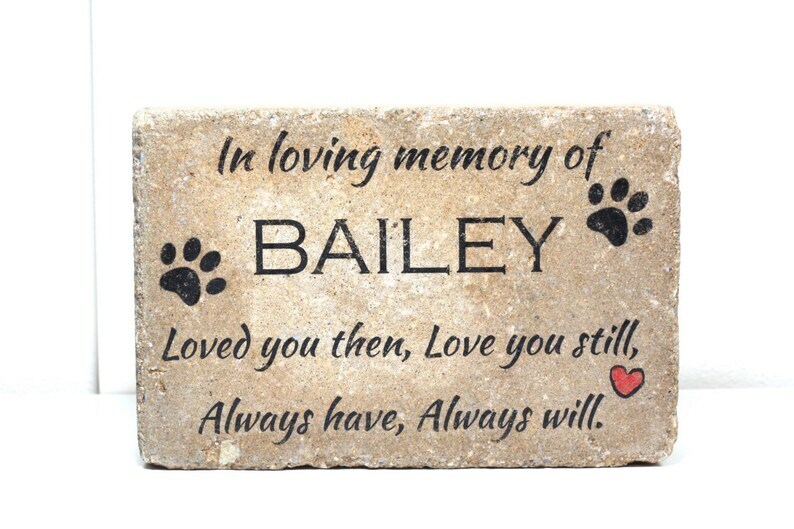 The name "BAILEY" will be replaced with the name of your beloved pet. Beautiful, rustic and simple, this stone is FULLY CUSTOMIZED. A date could be added below the name if desired. This stone is fully sealed and can be used indoor or outdoor. HOW TO ORDER: At checkout, choose NAME CHANGE ONLY if you only need the name changed. Choose CUSTOM MESSAGE if you ALSO want a different message than what is shown. Any changes you wish to see (including the name you need), leave in the notes section of checkout. 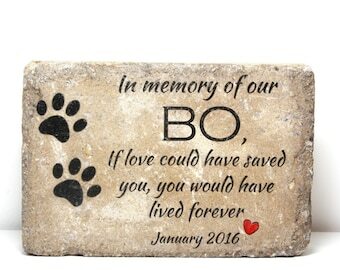 I will assume you want the top line "In loving memory of" and the paw prints and heart to stay, unless you mention otherwise. ☞ Indoor or Outdoor Rustic Decor. ☼ The most versatile rustic decor you will ever own or give away! 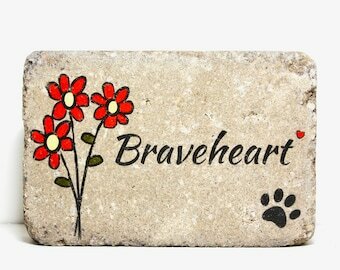 It can be used both indoors or out...perfect for those who love to rearrange:) Place it on a bookshelf, use it as a door stop, put it by the kitchen sink or set it amongst your flowers. These look beautiful in planters as well as on a fireplace mantle. ☼ Each “stone” starts with a rustic tumbled concrete paver. There is no vinyl used on any stone. A variety of high quality inks, stains and paints are applied. The stone is then sealed with an exterior sealer which allows you to place it indoors or out. ☼ The slight variation in color and “flaws” is part of the rustic appeal. I only choose stones that I would want to receive and best suit the design being created on them. ✹ HOW ARE THESE SHIPPED? ... USPS Priority Mail (1-3 day delivery) Each is “rustically wrapped” with wide kraft paper. These heavy “stones” are then packaged with care to ensure a safe delivery. ✹ EXPECTED TIME FROM ORDER TO SHIPPING... From 3-4 business days (depending on the amount of stones I am working on). ✹ DO YOU TAKE CUSTOM PIECES? Yes, I love creating new pieces or tweaking ones I have to make it exactly what you are looking for. Again, just ask...I try to do my best getting back to you quickly. Very pleased with this product! Better quality than I expected. Thank you! Not happy with USPS! The delivery was a day late. This block is solid and heavy. They stuffed it in my letter mailbox. We are lucky it is still attatched to the house. We had hoped they would have rang the doorbell to notify us of the delivery. Luckily, we saw it delivered and retrieved it right away. This is common for USPS. I replaced my original marker because it didn’t hold up in the weather. This is perfect!